Baba Ramdev's Patanjali partners BSNL for 'Swadeshi Samriddhi' SIM card; offers 2GB data for Rs 144. 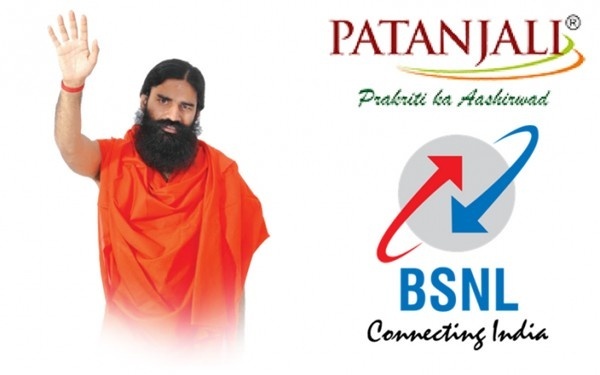 After gaining popularity in the consumer goods market, Baba Ramdev's Patanjali is now entering the telecom space in collaboration with State-owned Bharat Sanchar Nigam Limited (BSNL). Patanjali on Sunday launched its own SIM cards called Swadeshi Samriddhi SIM cards. According to Patanjali, the SIM cards will come with 2GB data and unlimited calling plans. Baba Ramdev's Patanjali is also giving several benefits to customers who get the Swadeshi Samriddhi SIM card. For now, the Swadeshi Samriddhi SIM card and its benefits will be available only to Patanjali employees. As of now, there's no information on when the SIM card will be available publicly, but chances are that the full-fledged launch may happen in the next few months or so. After the SIM card becomes available to everyone, its users will also get up to 10 per cent discount on Patanjali products. Patanjali earlier this year announced a strategic partnership with e-commerce retail stores like Flipkart, Amazon, Paytm Mall and others to sell its products. The partnership with BSNL will extend its reach to more consumers. Coming back to the newly-launched Swadeshi Samriddhi SIM, which is the result of Patanjali and BSNL's partnership, the customers will need to recharge the SIM card with Rs 144. After recharging, the customers will get 2GB of data, unlimited calling benefits and 100 SMSes. The validity period of the plan hasn't been revealed yet but chances are that it will be either 28 days or one month. BSNL believes that the Patanjali plan is BSNL's best tariff plan till date. To activate the SIM, customers will need to give their identity proof. Speaking on Patanjali and BSNL's partnership, Sunil Garg, BSNL Chief General Manager said, "Patanjali's plan is BSNL's best plan. In Rs 144, one can make unlimited calls from any part of the country. We are giving 2 GB data pack, 100 SMSs. The members of the Patanjali have to just show their identity and there SIM will be activated soon after some paperwork." Alongside the data and voice calling benefits, the Swadeshi Samriddhi SIM also offers health, accidental and life insurances to the customers. Baba Ramdev said that the SIM card comes with the medical insurance covers of Rs 2.5 lakh, while the life insurance provides Rs 5 lakh cover. However, the covers can only be availed in the case of road accident. He further said that the key idea behind introducing this SIM card is "prosperity for charity". Commenting on the launch of the new SIM card in collaboration with the state-owned BSNL, Baba Ramdev on Sunday said that the key idea behind introducing the Swadeshi Samriddhi SIM card is to put together a "Swadeshi network". Speaking on the availability of the SIM cards, Ramdev said, "There are five lakh counters of BSNL and from there people can soon get Patanjali swadeshi-samradhi card." 1. Only the employees and office bearers of Patanjali will be able to avail the benefits of the Swadeshi Samriddhi SIM card, the company said on microblogging site Twitter. If the scheme is successful, it will be extended to the general public, the company said separately on Facebook. 2. Patanjali Ayurved said the profits earned from the Swadeshi Samriddhi SIM card will be used in the welfare of the country. 3. After its full launch, customers will get a discount of 10 per cent on Patanjali products with the Swadeshi Samriddhi SIM card, according to ANI. Apart from this, people will also get health, accidental and life insurance benefits, it noted. 4. The Swadeshi Samriddhi SIM card will offer unlimited calls along with 2 GB data and 100 SMSes in a recharge voucher of Rs. 144, according to ANI. The agency, however, did not mention the validity period of the recharge pack. 5. The general public will soon be able to get Patanjali Swadeshi-Samriddhi cards from five lakh counters of BSNL, ANI cited Ramdev as saying.